I can't pinpoint the exact moment, but somewhere over the course of the last three albums or so, Metric lost the plot for me. The exciting, energetic, melodic tunes disappeared in a morass of electronic goo. 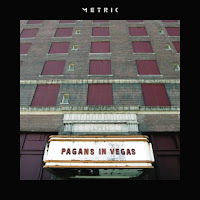 Last week the band released another album of new material, Pagans In Vegas. Unfortunately, it continues the group's downward trajectory (at least in my eyes). It seems like the band are intent on shooting themselves in the foot. A wonky zip-zap electronic ruins the chorus of the otherwise compelling "The Shade". On "Celebrate" Emily Haines sounds almost like a voice from on high. That's completely undermined by an incredibly pedestrian arrangement. In other instances, there's simply no spark to the song. "Cascades" creeps along to nowhere. "Other Side" is pleasant, but has all the substance of marshmallow Fluff. The worst elements of '80s techno pop surround far too many of these tracks. A handful of tracks do stand out for positive reasons. The force, driving "Too Bad, So Sad" could be the template for a song in which the singer is in total control. There's a deadpan delivery to "Blind Valentine" that lends it a great tongue-in-cheek feel. The arrangement on "For Kicks" is spacious, making it a bright and airy track. Metric undoubtedly save the worst for last. "The Governess" is methodical and overly melodramatic. And while "The Face, Pt I" is a drone-filled mess, the final cut, "The Face, Pt II", is absolutely unlistenable. Of course, judging from the scale of success that Metric have had, I am in a tiny minority with my opinion. Metric plays the Danforth Music Hall tonight. Best tracks: "Too Bad, So Sad", "Blind Valentine"